Sweden released its preliminary roster late Monday, a mix of experienced Olympic players and rising stars as it seeks to reclaim men's hockey gold at the Sochi Games in February 2014. Sweden released its preliminary roster late Monday as it seeks to reclaim Olympic men's hockey gold at the Sochi Games in February 2014. Forwards Daniel and Henrik Sedin and defenceman Alex Edler of the Vancouver Canucks highlight the list of 35 players. The Sedins will be looking to make their third Olympic appearance, while Edler hopes to make his debut. 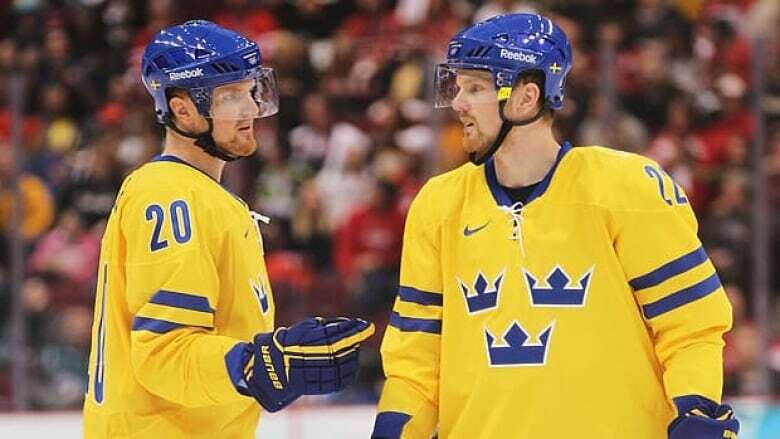 The Sedins are among a dozen players invited who were part of Sweden's roster at the 2010 Olympics in Vancouver, a team that lost in the quarter-finals to Slovakia. The most notable absence from the list is Daniel Alfredsson, who jumped ship this summer after nearly two decades with the Ottawa Senators for Detroit. However, there is nothing preventing the 40-year-old Alfredsson from earning a spot on the Sochi team. Also not on the list: Winnipeg Jets defenceman Tobias Enstrom and New Jersey blue-liner Adam Larsson, who's yet to gain a secure NHL foothold after getting drafted fourth overall in 2011. Senators defenceman Erik Karlsson, the Norris Trophy winner in 2011-12 as the NHL's top defenceman, leads a strong group of blue-liners. The strongest candidates for Sochi on the back end include Niklas Kronwall of Detroit and Oliver Ekman-Larsson of Phoenix, with other NHL players such as Victor Hedman of Tampa Bay and Jonas Brodin of Minnesota looking to get into the mix. New York Rangers star Henrik Lundqvist will look to man the nets for the third straight Olympic tournament. He is joined on the list by three goalies who would each be making their Olympic debut if they make the final cut: Robin Lehner of the Senators, Viktor Fasth of Anahiem, and Jhonas Enroth of Buffalo. Lundqvist's twin brother, Joel, who plays professionally in his native country, is among the list of 18 forwards. The NHL centremen and wingers looking to return to the Olympics among that group include Henrik Zetterberg and Johan Franzen of Detroit, Washington's Nicklas Backstrom, Loui Eriksson of Boston, and Patric Hornqvist of Nashville. Those looking for their first Olympic experience up front for Sweden are Gabriel Landeskog of Colorado, Carl Hagelin of the Rangers, and St. Louis forwards Patrik Berglund and Alex Steen. The players will be in Stocholm for an orientation camp Aug. 12-14 in Stockholm. Sweden has reached the podium just once in the four Olympic men's hockey tournaments to heavily feature NHL players, but that was a gold medal performance at the Turin Games in 2006. Remaining from that team are Lundqvist, Kronwall, the Sedin twins and Zetterberg. Zetterberg has the most Olympic seniority of all, suiting up at the 2002 Salt Lake City Games, where the Swedes were upset in the quarter-finals by Belarus.